Home / Blog » What Can You Do to Promote Herniated Disc Recovery? In some cases, your doctor may recommend that you treat your herniated disc at home yourself. You can allow your back to heal by restricting your activity, applying ice and heat to the affected area, and taking over-the-counter pain medications. It can take between four and six weeks for pain to resolve with this kind of treatment, and your doctor may recommend trying these methods to see if they work before moving on to other treatments. When self-care is not enough to treat herniated disc pain, your back doctor may prescribe medications to control your symptoms and reduce the swelling of the discs. He or she may prescribe NSAIDs, analgesics, muscle relaxants, and steroids. 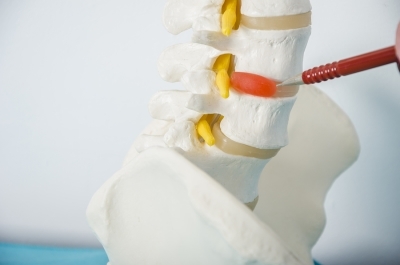 Your back doctor may also perform steroid injections into the area of your herniated disc to reduce swelling and ease nerve inflammation. Taking medications along with using self-care techniques including rest and ice/heart therapy can be especially helpful. For some people, surgery is the best solution. Your doctor will usually only recommend surgery if conservative treatments have not been effective or if you have evidence of nerve damage, like loss of feeling in the legs. Two different procedures: microsurgical discectomy and minimally invasive microendoscopic discectomy. Microsurgical discectomy requires a small incision in the middle of the back so that part of the damaged disc can be removed. This procedure requires an approximately six-week recovery period. Minimally invasive microendoscopic discectomy has a shorter recovery period because it is less invasive and requires less disruption of the tissue in the back.